I was watching Carte Blanche Medical the other night and they featured a research-couple in America working on a cure for colour blindness in humans. And off course all studies are usually always done on animals first. From a behaviourist and animal lovers point of view there were two things that I was happy about. Firstly, the good condition and care that goes into their research subjects (the monkeys) and that someone has publicly stated – that not all animals see just only black and white! Let’s hope to put that myth to bed once and for all. Often I still hear that dogs see black or with white and shades of grey. Due to the domestication process, dogs’ eye sight has changed to become more adaptable in human society. “Most humans have the ability to see all the different colours of the electromagnetic spectrum. Through evolution, the dog and the human each developed their own visual system that works best for them. Humans have depended on their diurnal (most active dusk and dawn) ability and a sense of colour throughout time to help them find food. Dogs on the other hand, were not originally diurnal animals, until humans domesticated them. Their ability to see at night was originally more important to the dog than colour” (1). 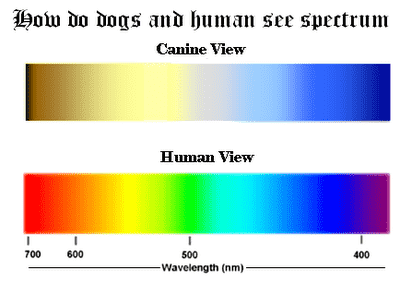 Through the studies by Neitz, Geist and Jacobs (2) it has been suggested that an average dog sees similar to a human deuteranope, a person that is red-green colour blind. This does not mean that your dog could not be colour blind – they could also have the same eye condition that humans have who are colour blind. Therefore, the dog’s world consists of yellows, blues, and grays. When a human perceives a red object it appears as yellow to the dog, while a green object appears as white or a shade of gray. This white region, also called the neutral point, occurs around 480 nm in the visual spectrum. According to the electromagnetic spectrum, 480 nm would appear as a greenish-blue hue. All wavelengths longer than the neutral point are indistinguishable from one another to the dog and would all appear as yellow. Humans may have the ability to perceive a more colourful world than the dog; however the dog’s ability to see at low light and the ability to detect movement is far better than the human. (1) “Color and Acuity Differences between Dogs and Humans”, posted in 1998 on University of Wisconsin website by Jennifer Davis.